The new BBC Scotland channel has broadcast for the first time. 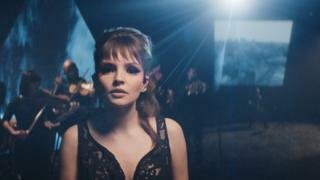 A specially-commissioned short film featuring Scottish band Chvrches and the BBC Scottish Symphony Orchestra opened proceedings. Chvrches' singer Lauren Mayberry was the first voice to be heard on the channel, performing the band's song Miracle accompanied by images of Scottish people, places and landscapes. The channel will feature hundreds of hours of newly-commissioned programmes. She told BBC Radio Scotland: "I'm certainly not fixated on a particular audience segment at this stage. "I think it would be folly to try too hard to anticipate numbers - either low or high. "What we're looking to achieve is success over time and I guess audience appreciation in Scotland." What was there to see on launch night? The first programme - a special one-off entertainment show - was presented by Iain Stirling, the Scottish comedian best known for his Love Island voiceover. "A Night At The Theatre" featured chart stars Lewis Capaldi and Nina Nesbitt, as well as comedians Elaine C Smith and Larry Dean. "Getting Hitched Asian Style", a series that goes behind the scenes with Scotland's biggest Asian wedding planners, was also on the schedule. And the channel aired "The People's News", in which Scots speak their minds on the events of the week. The channel has also broadcast the first episode of the final series of popular sitcom Still Game. All six episodes of Jack and Victor's ninth series will be going out on BBC One across the UK later in the year. The launch night also featured a one-off return for cult sketch show Burnistoun, taking a sideways looks at the world of television. The TV premiere of the Bafta Scotland-winning film Nae Pasaran, which tells how Scottish workers stood against the Chilean dictator General Pinochet and his regime, brought the first night of the new channel to a close. The new channel is available in High Definition (HD) via Freeview/YouView, Sky, Freesat and Virgin Media. It is also be available in standard definition (SD) on Freeview in position 9, although re-tuning is required. For Freeview customers in Scotland only, BBC Four SD has moved down the EPG to position 82. Sky and Freesat viewers without an HD-capable receiver automatically receive BBC Scotland in SD instead. New four-part drama Guilt is among the new channel's freshly-commissioned shows. Also in the channel's documentary offering is Inside Central Station, a six-part series about the people behind the busiest railway station in Scotland, and The Children's Hospital - an eight-part series on the work of staff inside the Royal Aberdeen Children's Hospital. Jess Brittain's series Clique will have its second season screened on the new channel and episodes of established Scottish drama River City will appear in the schedule on Monday nights, before being repeated on BBC One Scotland on Tuesdays.